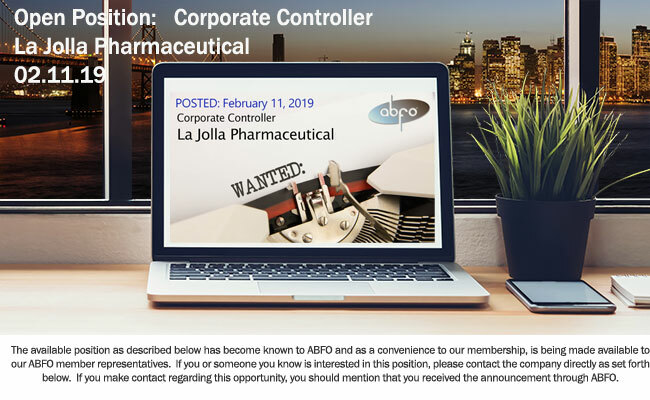 La Jolla Pharmaceutical Company is a biopharmaceutical company focused on the discovery, development and commercialization of innovative therapies intended to significantly improve outcomes in patients suffering from life-threatening diseases. Giapreza (angiotensin II), was approved by the U.S. Food and Drug Administration in December 2017 as a vasoconstrictor to increase blood pressure in adults with septic or other distributive shock. Giapreza became available for patients in the U.S. starting in March 2018. Oversee the entire internal and external accounting function and overall day-to-day management of accounting and controls of this dynamic, high-growth company. Ensure the accounting department serves the accounting needs of strategic partners, investors, the overall company and the various operating groups within the organization. Also ensure that the monthly, quarterly and annual financial, regulatory and management reporting is completed on a timely basis and in accordance with GAAP. The Corporate Controller responsibilities include accounting operations, taxation, internal controls (including SOX 404), audit, stock administration and SEC reporting. The Corporate Controller is the primary point of contact with key vendor partners including external auditors, third-party tax professionals, bank operations partners and other third-party service providers. Oversee the operations of the accounting department, including optimizing the departmental organizational structure and processes to achieve department's goals and objectives. Provide leadership in the accounting, controls, compliance and reporting. Lead and oversee all general accounting functions, including the monthly general ledger and consolidated level financial close processes, cost accounting and accounting operations, consisting of accounts payable, payroll and accounts receivable transaction processing, inventory, fixed asset management, consolidation and management reporting. Ensure efficient, effective execution of transactions as well as compliance with the company’s policies in these areas. Evaluate and make recommendations with respect to automation or other opportunities to improve the effectiveness of the department. Lead and coordinate the preparation of all aspects of SEC external reporting, including the preparation of financial footnotes and Management's Discussion and Analysis (MD&A) and coordination of document review with management and external audit team. Prepare and present to management and the Audit Committee of the Board of Directors with timely reviews of organization's financial status and progress in its various programs and activities, including financial reporting and disclosure revisions due to changes in the regulatory framework, generally accepted accounting principles and reporting requirements. Manage accounting team by providing overall direction, coordination, and evaluation of these employees. Carries out supervisory responsibilities in accordance with the organization's policies and applicable laws. Responsibilities include interviewing, hiring, and training employees; planning, assigning, and directing work; appraising performance; rewarding and disciplining employees; addressing complaints and resolving problems. Assess, implement and maintain accounting systems and business tools. Bachelor’ degree (BS/BA) in Accounting; CPA or equivalent required. 8+ years of progressive combined public and private industry accounting related experience, including minimum of ~4 years in a public company with responsibility for regulatory/SEC document management; industry experience in biotechnology and/or pharmaceutical sector preferred. Strong experience in SEC reporting, management reporting, technical accounting research and implementation of business process improvement. Biotech/pharma experience including commercial revenue and clinical trials accounting experience required. Expertise in Microsoft Word and Excel, and in financial, equity, payroll and purchasing software, such as Equity Edge, Certent, and Great Plains.